For The Love Of Art: Happy Birthday Amy! Hello Pinquettes! I think that Summer is upon us (at least it feels that way, lol). 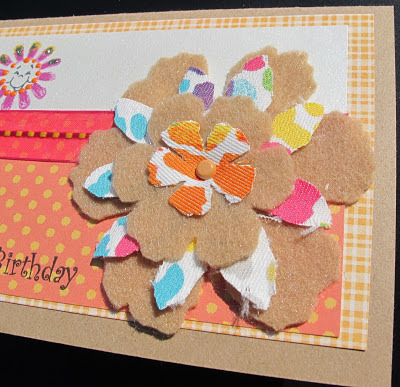 I have a very simple Birthday card to share with you today and, of course, it has a beautiful Pinque Peacock flower from the May release. Wait 'til you see what the June release has in store for you. The ever talented Jess has truly out done herself! There I go again, changing the subject as usual! 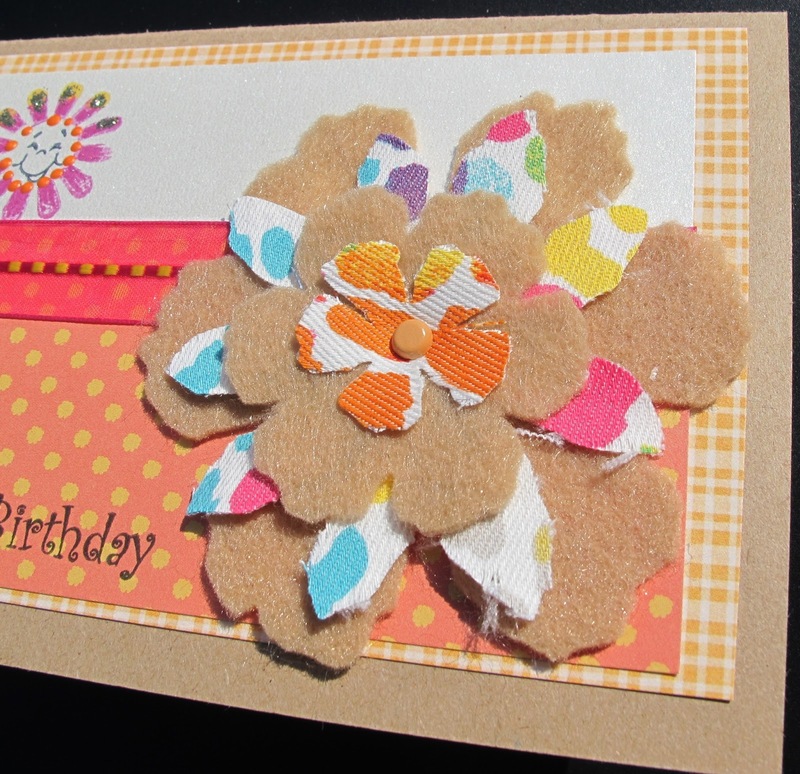 The card I made today is for my oldest daughter Amy (her birthday was yesterday). She loves the look of the Kraft card stock and not a lot of frills, more of a country look so that is what I went with. Ready to take a look? Look how gorgeous this flower is!!! Luckily I had some scrap paper that matched it perfectly. 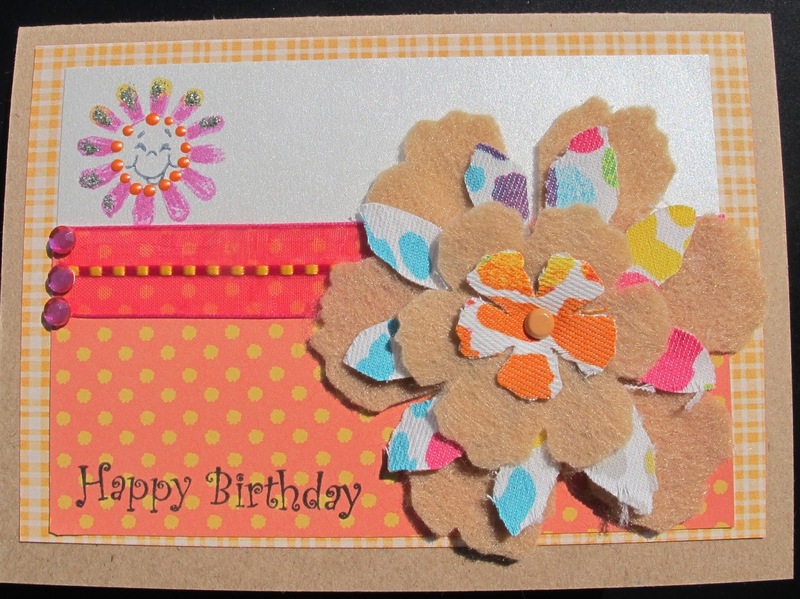 Since she has 3 children I had to add a little whimsical touch thus the Peachy Keen flower and smiley face stamps. The exct sets I used were PK-273 for faceless flowers and PK-570 Basic Paper Doll Faces for the happy smile. I used Momento Ink Markers in Dandelion and Lilac Posies which matches the colors on the fabric flowers perfectly. Of course I had to add a little sparkle so I used some gold stickles for where the sun was shining and some Pumpkin liquid pearls for the center of the flower. 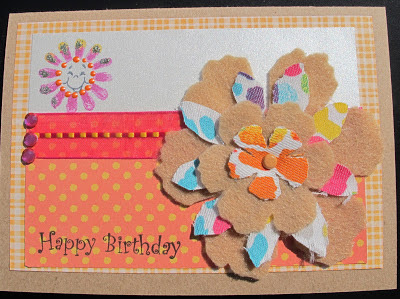 I also used a Pink By Design sentiment stamp ( age is only a #) for the Happy Birthday. My daughter loves this font so it is just the perfect touch to complete this card. I was lucky enough to have some sheer ribbon and rhinestones in the same color palette. I was really pleased with how this came out. You can find these beautiful flowers as well as a large selection of stick pins, beads and multiple styles of flowers over at the Pinque Peacock Shop HERE . Can't find what you are looking for? Just ask Jessica. She is so easy to work with and loves to do custom orders. Hi Pinque Peacock fans, followers, family and friends! First, a huge Thanks to everyone for being such awesome Peacocks. The launch of Pinque Peacock shop has been a phenomenal success. Now to celebrate with a fabulous prize! Be sure to read & follow the rules to grab as many opportunities to enter as you can. *For each item below, you must comment on THIS post only that you are doing it or have done it. Comments on any other post, while appreciated, will not qualify. Follower with the most points wins!!!! 3. 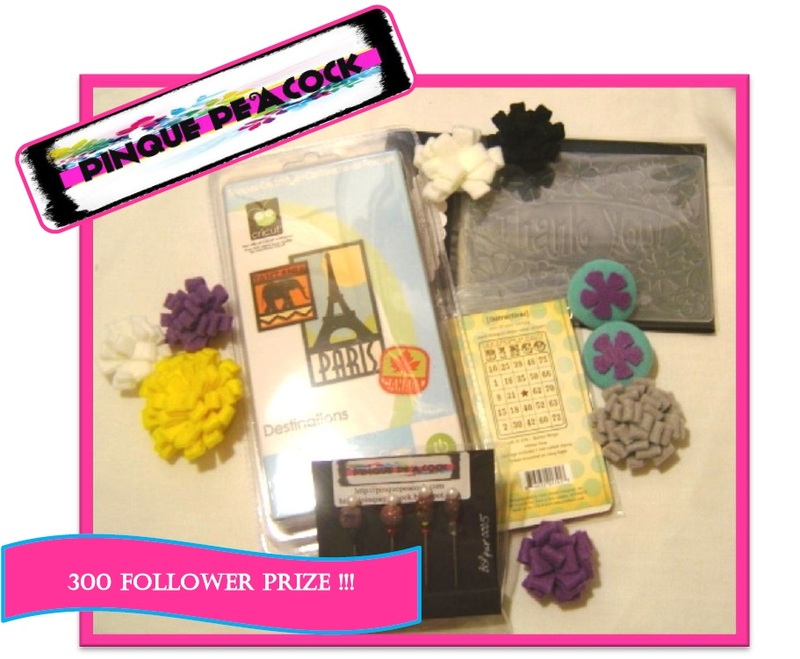 Grab the 300 Follower Giveaway button on the sidebar and place it on your sidebar. 1. Shop at the Pinque Peacock ~ no min amount of purchase. 2. Use Pinque Peacock product on your project and send us a link. you want. We super appreciate ya!! I hope you all enjoy the rest of the weekend and stay safe from the crazy storms that are popping up. Loved your beautiful card Mary!! !